1 GET JAMMIN’: Head over to the parks in downtown Boulder City on Saturday and Sunday for the annual Spring Jamboree presented by the Boulder City Chamber of Commerce. 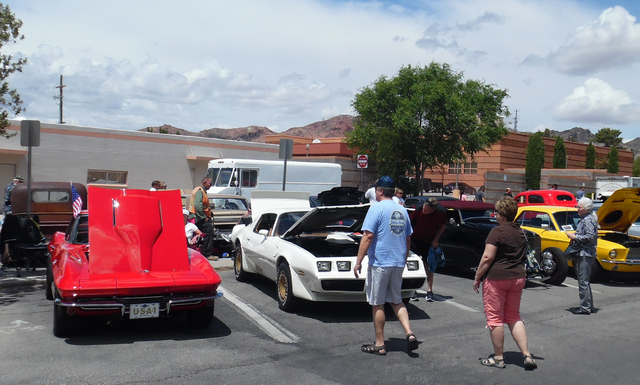 The family-friendly event will include a classic car show, antiques, arts and crafts, rock and gem show and kids zone. Highlights include the Little Miss and Mister Pageant and Bark in the Park. Admission is free. Visit www.springjamboree.com for a complete schedule of activities or call 702-293-2034. 2 CINCO DE BREW-O: Celebrate Cinco de Mayo on Friday with Mexican food and entertainment at the Boulder Dam Brewing Co. The celebration will include Mexican beers, cocktail and sangria, raffles and prizes. Full Flight, a rock-acoustic rock-alternative rock band from Las Vegas, will provide the musical entertainment. The “fiesta” starts at 7 p.m. The Brewpub is at 453 Nevada Way. Call 702-243-2739 or visit www.boulderdambrewing.com for more information. 3 TAKE A HIKE: With temperatures expected to be in the 90s on Friday , 80s on Saturday, and high 60s on Sunday, this weekend would be a good time to hike the trails surrounding Boulder City. For an easy stroll, take the Historic Railroad or River Mountain Loops trails at Lake Mead National Recreation Area. For more information about the trails within the park, visit https://www.nps.gov/lake/planyourvisit/hike.htm.